During the few days prior, preps were being made to make a day trip into NB. The convective outlooks were looking good and the area was upgraded to a marginal risk by early Saturday morning, so the decision was made to give it a go. Left PEI about 9:00am preceded westbound towards my target area of Woodstock. 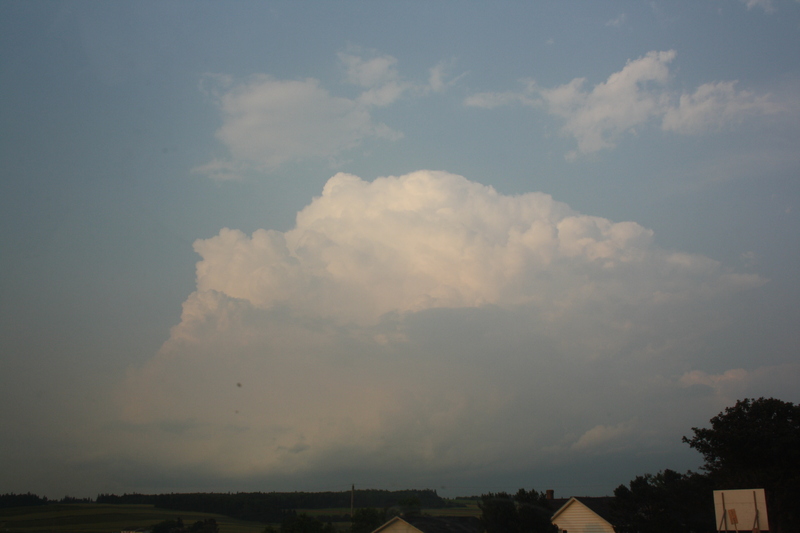 A large CU/TCU field developed just as we were passing Fredericton with strong storms already developing just across the border in Maine. One particular storm was already severe warned in the Houlton area and moving towards Woodstock. Environment Canada had already issued severe thunderstorm watches for most of NB and these were being upgraded to warnings in effected areas including my location. We quickly proceeded and arrived in Woodstock just minutes prior to the storm hitting. Didn’t have time to get set-up. We just parked the car in a retail parking lot then got buffeted by extremely heavy rain and very strong gust front winds up to 40 MPH. No Hail. Did Managed to get some video of this. There was local town flooding. The storm passed by so the decision was made to head back towards Fredericton. Drive through the storm and get out ahead of it and stay ahead of it all the way to PEI. Unfortunately, several storms developed into a line which basically drifted to the ENE which put us in the front edge of the line all the way to Petitcodiac. We could not get out of the extremely heavy rain all the way from Wood stock through to Petitcodiac. One particular storm cell just east of Oromocto showed signs of rotation on Velocity radar as well as visually. 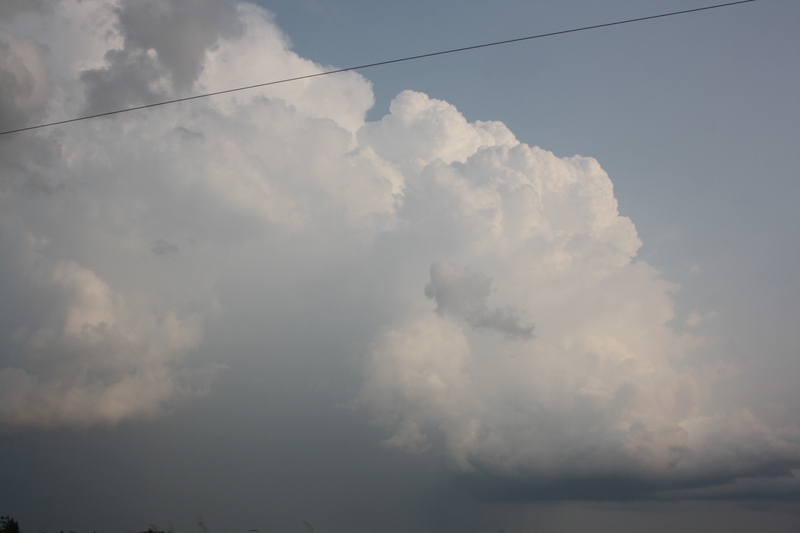 Looked liked several lowerings and some minor rotation in the base of the storm but never developed beyond that. 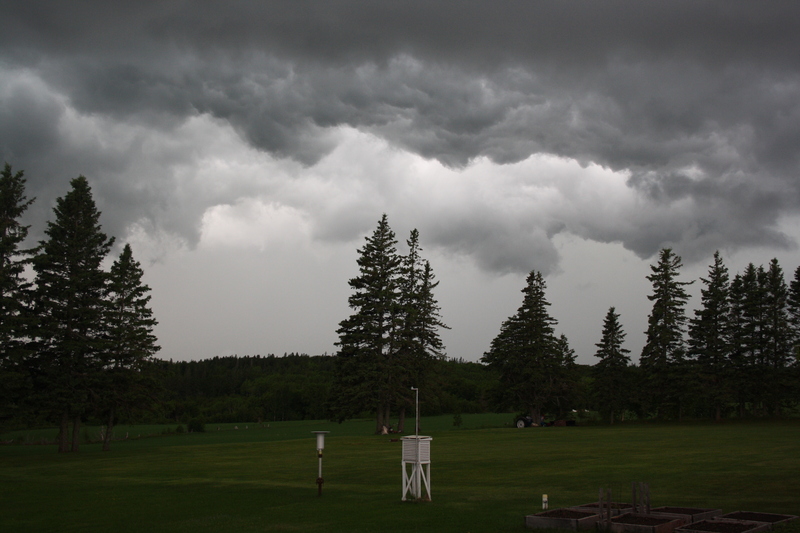 It was only 15 minutes later that I learned that Environment Canada had issued a Tornado watch on this particular cell and by this time the watch had been cancelled. So I actually missed this important piece of information. The main reason this was missed was because of the numerous other watches and warnings that were in effect at the time and there was no way to pick out the “Tornado watch” from the severe thunderstorm watches that were in effect. So this important piece of information was overlooked. Will talk to the folks at EC to discuss this issue. All and all, a fun and successful chase through NB. Cape and LI values were improving across the region and thunderstorms were expected to develop ahead of an approaching cold front although there was no suggestion of any expected severe development by either EC or SPC although I was expecting strong activity. 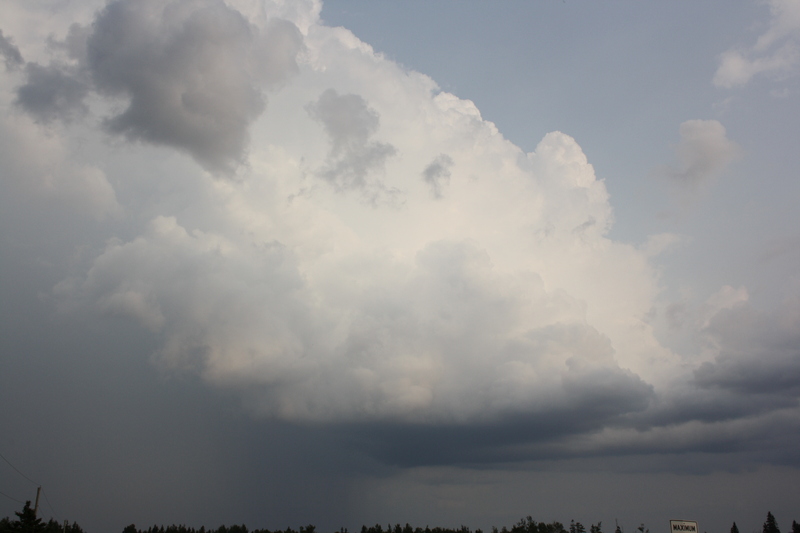 Storms started to develop near Fredericton NB during mid morning and and intensified resulting in a severe thunderstorm watch being issued. More cells were developing through central NB so I decided to attempt a chase through the southeastern part of that province. Watches were soon upgraded to warnings as cells continued to develop. 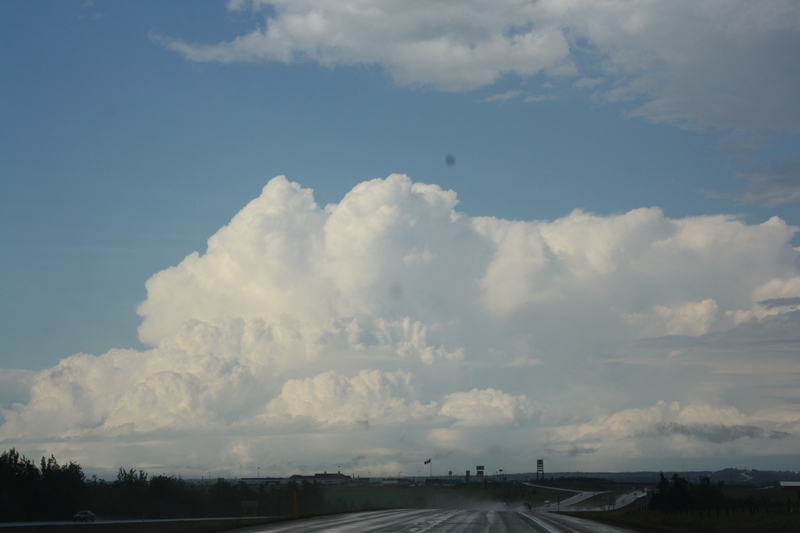 Cells were developing everywhere across the Moncton area and encountered a very heavy downpour north of that city. Continued west and set-up just west of the Salisbury Big stop under the inflow of an approaching cell. 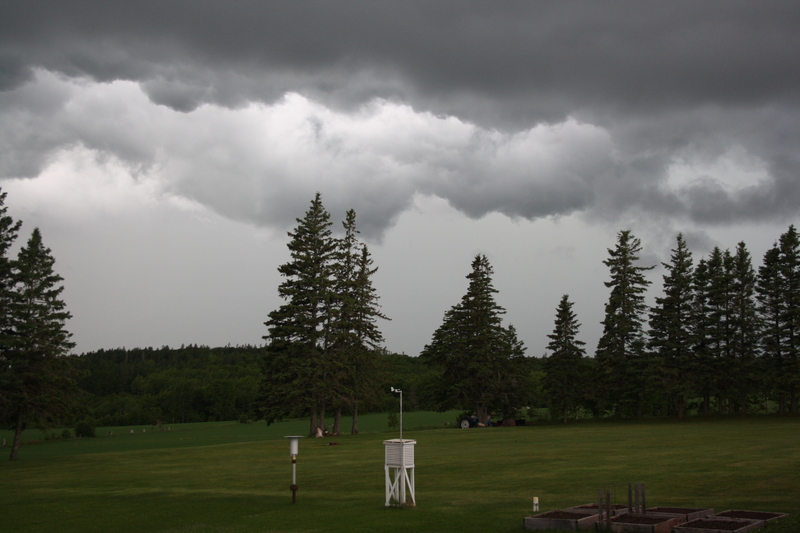 Weak rotation was observed and a call to the Environment Canada storm center was made. Decided to wait there for the approaching precipitation field which again became extremely heavy with pea-marble size hail associated. Another call was made to the Environment Canada severe weather center to report this activity. Wind never really became an issue. 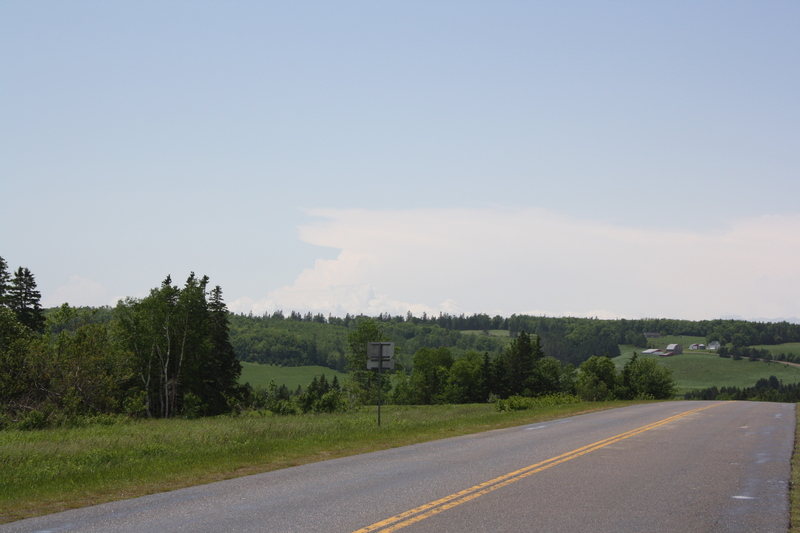 After the storm passed, decided to turn back toward PEI and observed a massive cell developing north of Moncton tracking eastward which prompted a severe thunderstorm watch for Prince County of PEI. 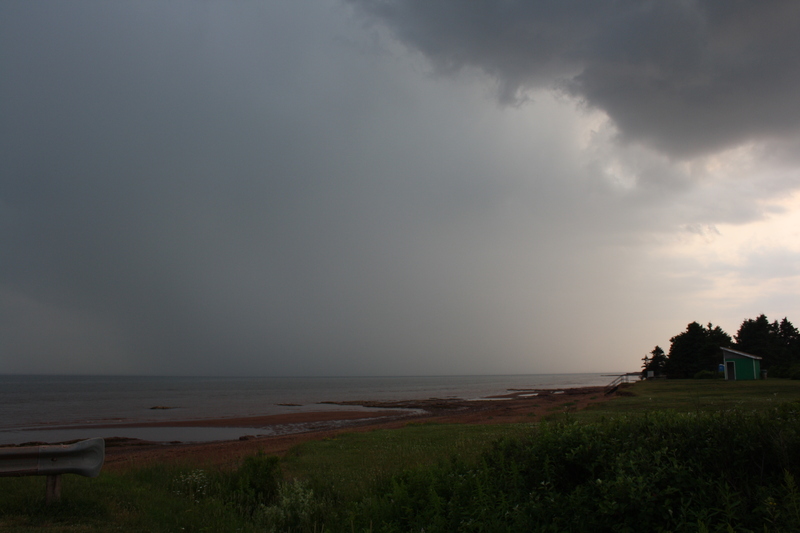 This cell tracked over the Northumberland Strait and weakened rapidly over the cool waters but did encounter the outflow boundary near the Port Elgin area which resulted in another very heavy downpour. Total distance traveled was near 400 KMS. All watches and warnings for the region had been dropped by early evening. Here are a few pictures of today’s chase. A warm unstable airmass had engulfed the region on Friday with the forecast for Saturday from EC and SPC looking good. New Brunswick was looking good and targeted the Grand Falls region which is located in the northwest part of the province. Unfortunately due to circumstances, I was late leaving PEI and basically playing catch-up to try and get into position. before late afternoon. 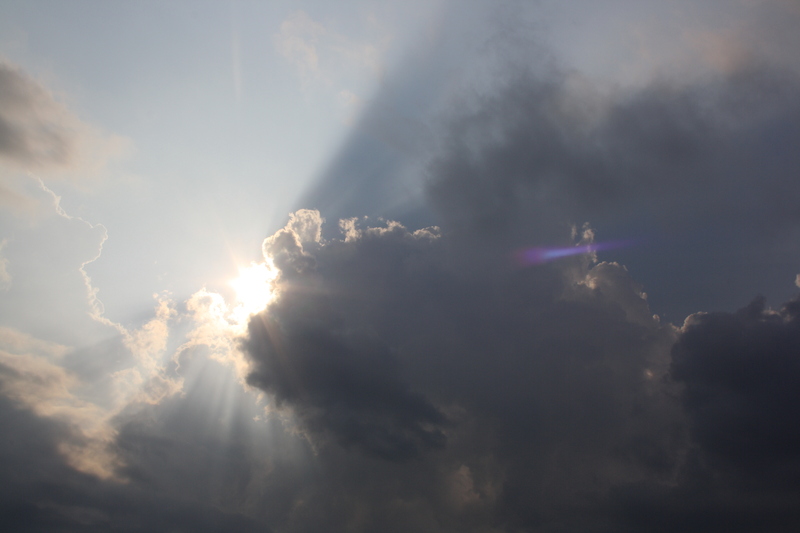 Clouds were building quickly by earlier afternoon and I had nit yet reached by target area. 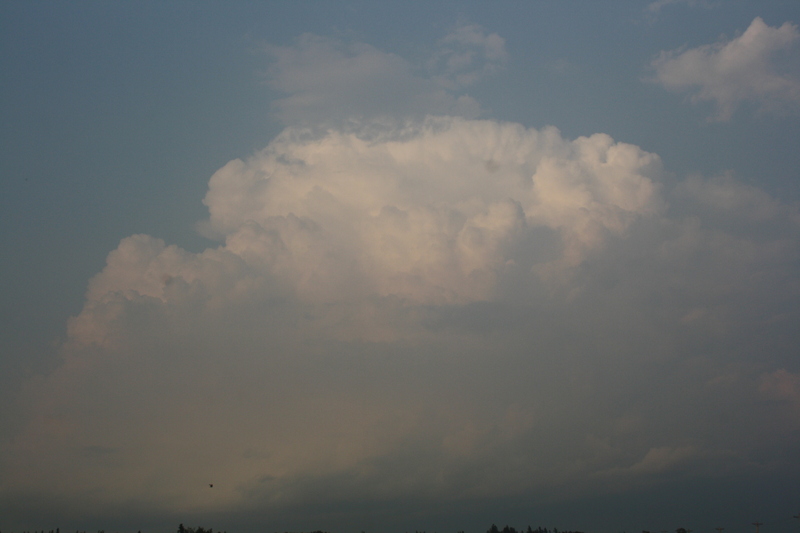 Intercepted a developing thunderstorm just south of Woodstock. Radar returns were not that impressive so decided to keep driving northwest. Big mistake. !!!! Reached my target area and had to stop to get some supper as we had been on the road for a few hours. My second mistake !!. 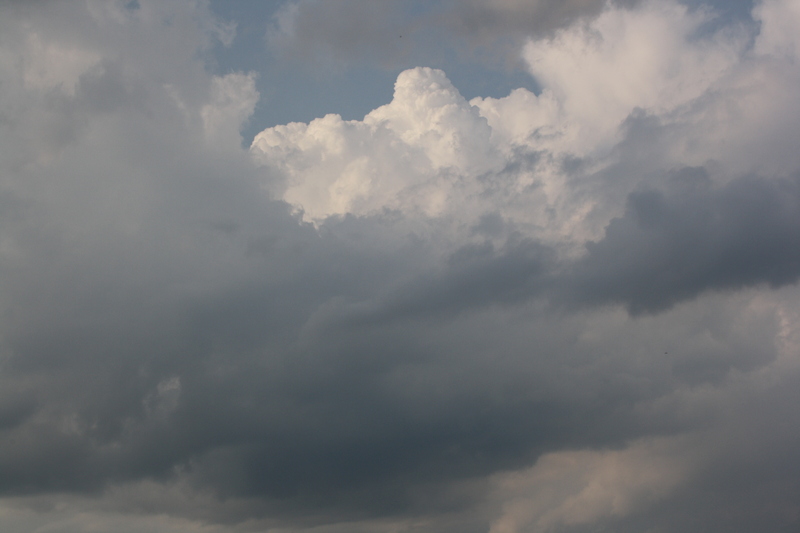 While we were in the restaurant, a storm developed almost right over us but could not chase. Middle of supper. Gobbled down the food, paid the bill and tried to catch up to this cell but unfortunately the road network in northwestern NB inhibited a real chase. Lots of trees and lack of roads. Meanwhile the storm that I had passed up on near Fredericton had developed into a severe storm and Severe thunderstorm warning were issued on that one as well as the storm that has passed over me while sitting the restaurant. 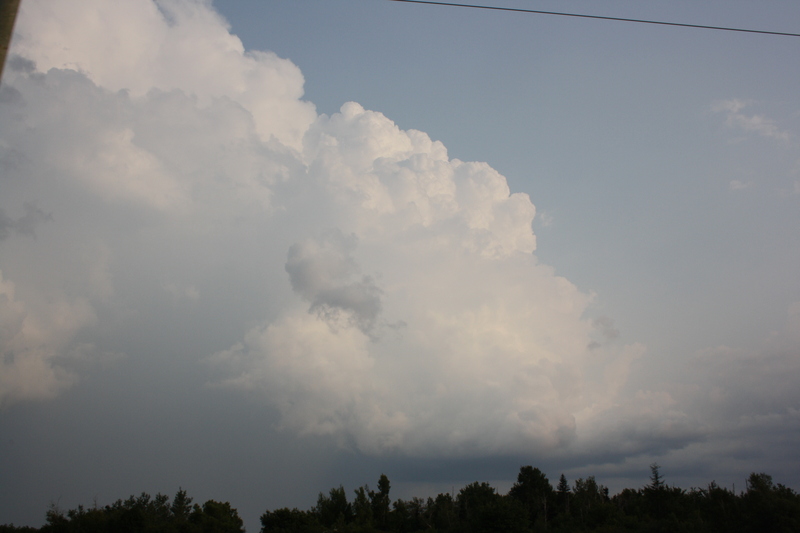 The cell near Fredericton continued to develop and a tornado warning was issued by early evening, unfortunately, I was 70 miles away at the time. With no more storm developing to our west over Maine, we decided to drive east toward these severe storms through the Renous highway of central NB. Arrived in Marimachi near 9:00pm to a nice lightning display. By this time, most warnings had been dropped. Spent the night there and drove home the following day with a few side trips into Kouchibouguac National Park on the east coast, and the city of Moncton. Total KMS driven was just over 1100. Here is the radar image of the storm on passed up on south of Woodstock. Radar image of the storm while I was stock in a restaurant. Here is the radar image of 2 tornado warned storms. 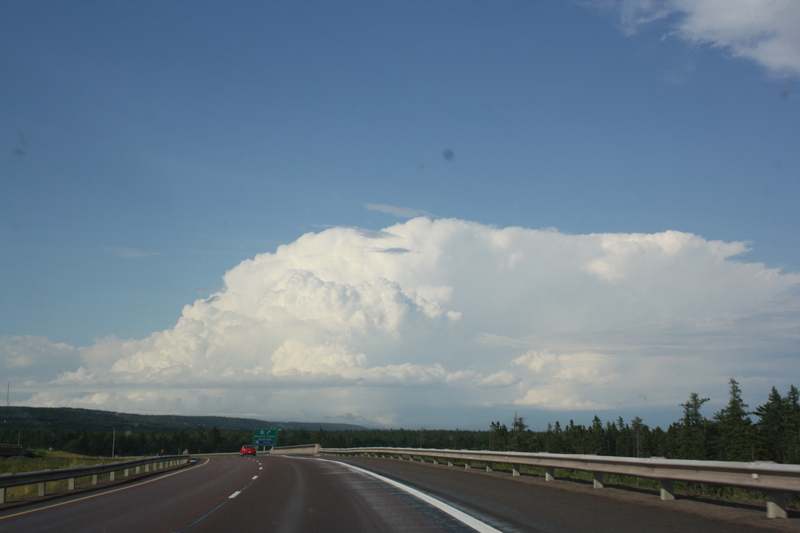 One near eastern NB, and the other between Grandfalls and Doaktown, I was about 25 miles behind this storm and couldn’t catch it. Lessons learned.. 1) Never be in a rush making decisions. Analyze the developing situation. 2) Be flexible and be ready to change the plan for the day. 3) Leave early on the chase day to ensure adequate time. 3) Make sure that hunger never interferes with a possible chase. 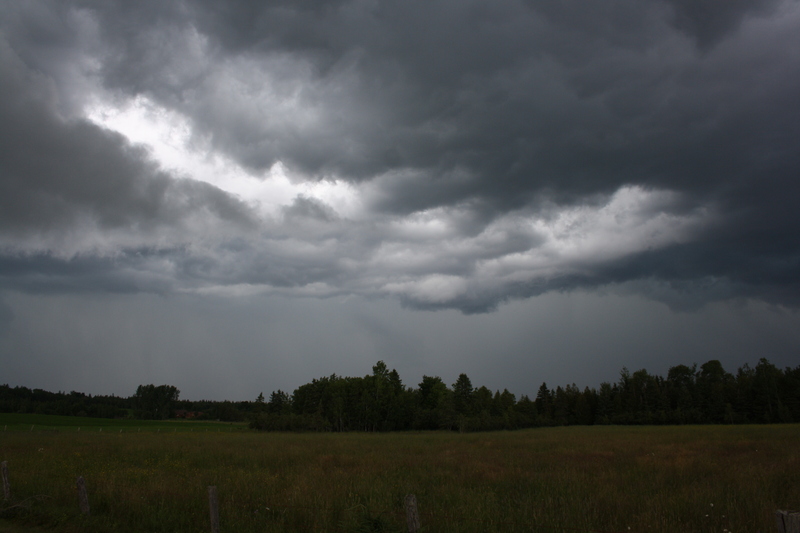 A warm unstable airmass was established across PEI during the day as a trough of low pressure crossed the district. 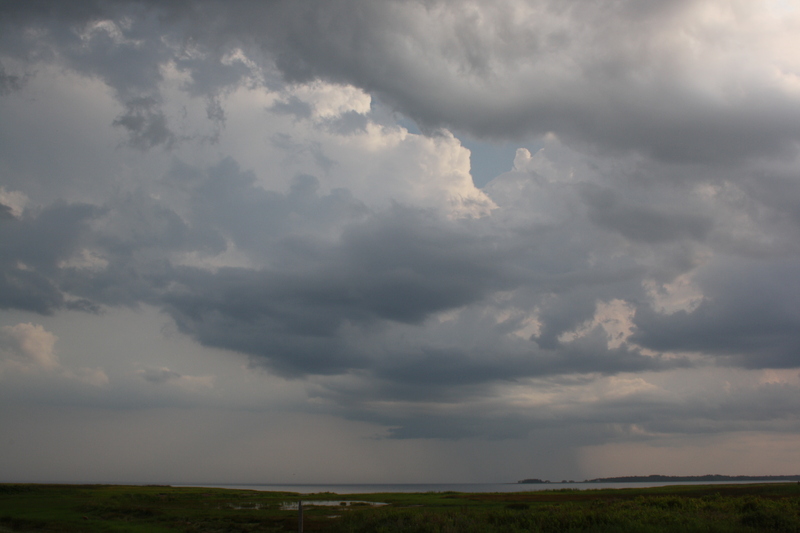 Small isolated thunderstorms developed over western PEI and proceeded to track southeast across the Island. 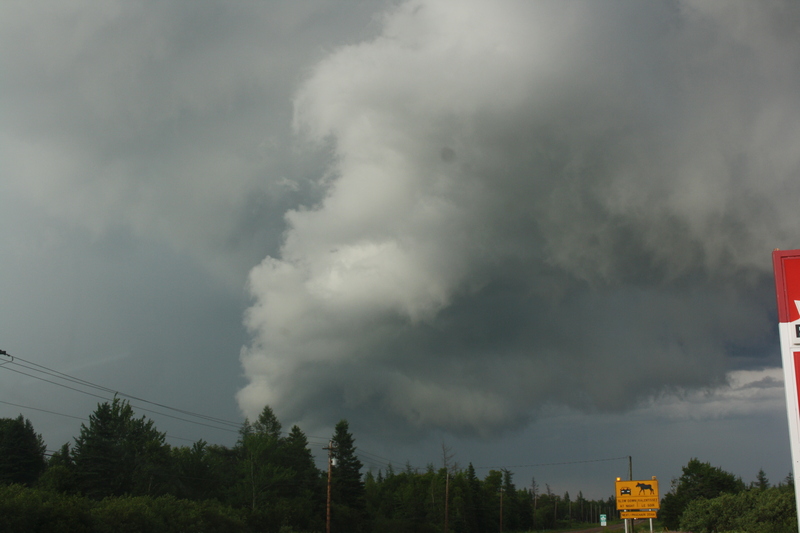 I headed west toward Summerside in an effort to intercept a one of 2 cells that had developed. This particle was heading along the south shore while the second was located along the north shore. I decided to track the southern storm and got into position at a provincial beach park. Here is a radar image of the storms at 6:10pm. Never really got into the storm as it remained just off shore where it disipated. The northern storm actually came onshore and remained intact for quite a bit longer but unfortunately, I was not in a position to intercept. (Picked the wrong storm). Anyhow, here are a few pictures from today’s chase. Thursday June 30th. Western PEI. Late afternoon. A low pressure system was centered in northwestern New Brunswick with a warm front draped eastward toward Newfoundland. 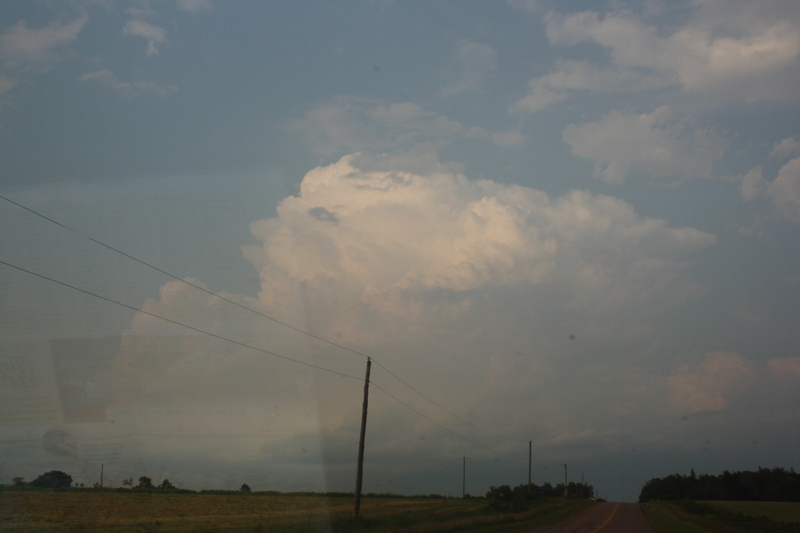 PEI was in the wam sector of an warm unstable moist airmass. Showers and thundershowers were developing in the this warm sector and ahead of the approaching cold front through eastern New Brunswick and basically tracking northeast. 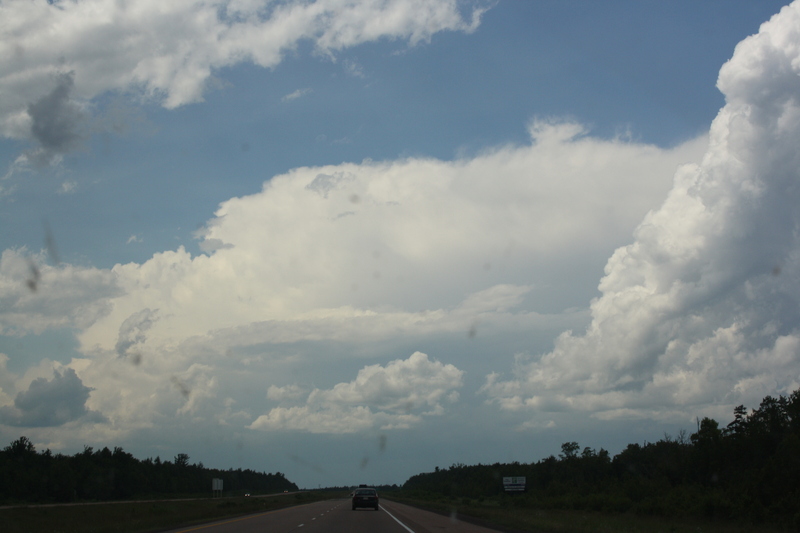 By mid afternoon a nice line of storms were observed in northeastern NB, so decided to drive to western PEI to try and intercept any development near Moncton. Arrived in western PEI late afternoon and set up in a provincial park along the beach west of Summerside. 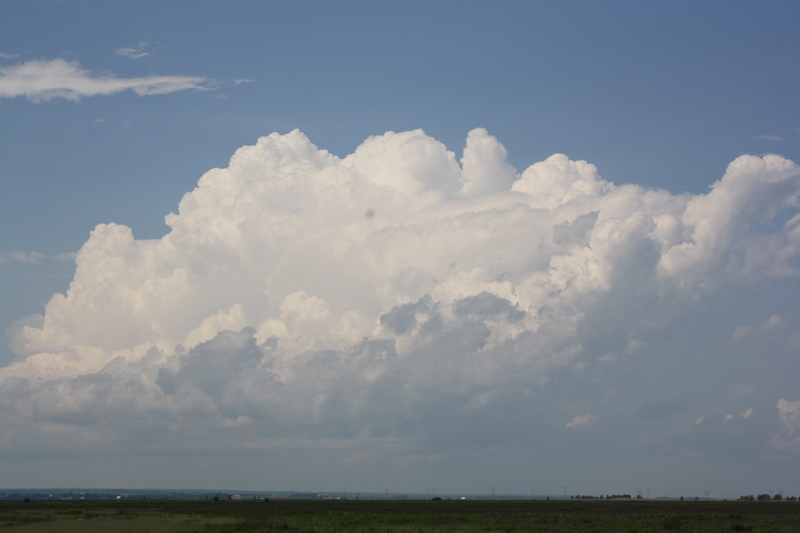 Lots of towering cumulus (TCU) clouds in all directions but main area was still over NB. After waiting for over an hour decided that this was a bust and headed back toward Summerside where we stopped to get some food. After we left the restaurant a very nice line of building TCU had developed right over the park we were originally at, so turned the car around and headed back. Intercepted the line just west of Summerside and encountered heavy rainshowers. Storms clouds were not that high maybe 25,000 ft or so. Lightning static on the AM radio but I never actually seen any strikes. 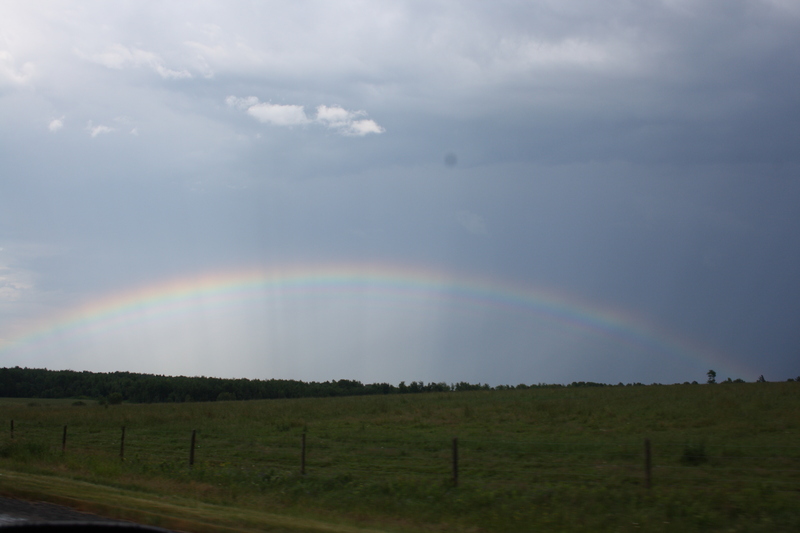 Once on the western side, the low sun was shining against the rain streaked line giving a majestic full double rainbow. Drove through the line again eastbound with no visible signs of lightning but still lightning discharges on the radio. By now, the storms had tracked to the northeast on the line and decided to continue home. Lots of sunlight TCU tops were visible above a layer of AC clouds in all directions. Here is a radar image of the developing line that was intercepted just west of Summerside at 7:10pm. Was this chase a bust? well maybe….. It was a nice afternoon for a drive, got to sit at a quiet beach for an hour or so and watch the building convective clouds. Did get to drive through a brief downpour where the energy from a Mature TCU was right on top of me and seen a fantastic double rainbow. The atmosphere was alive and active. A bust for thunderstorms but an awesome day. 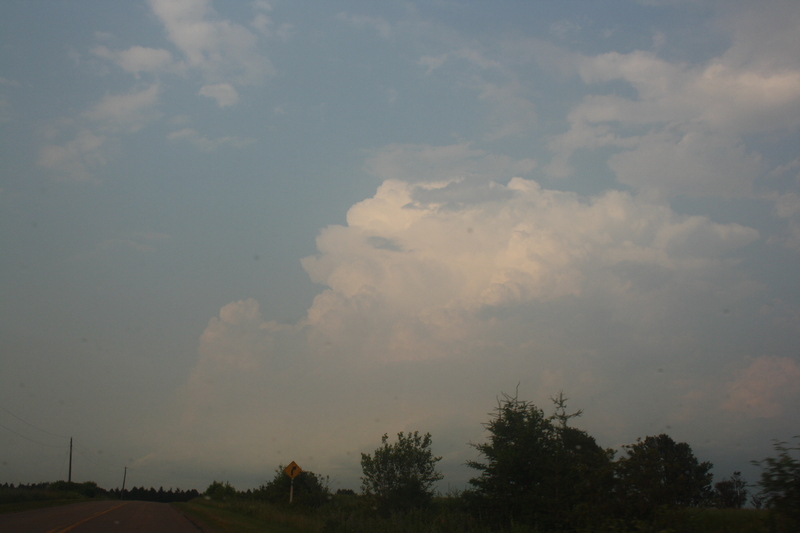 Sunday June 19 2011 Severe thunderstorm event central PEI. 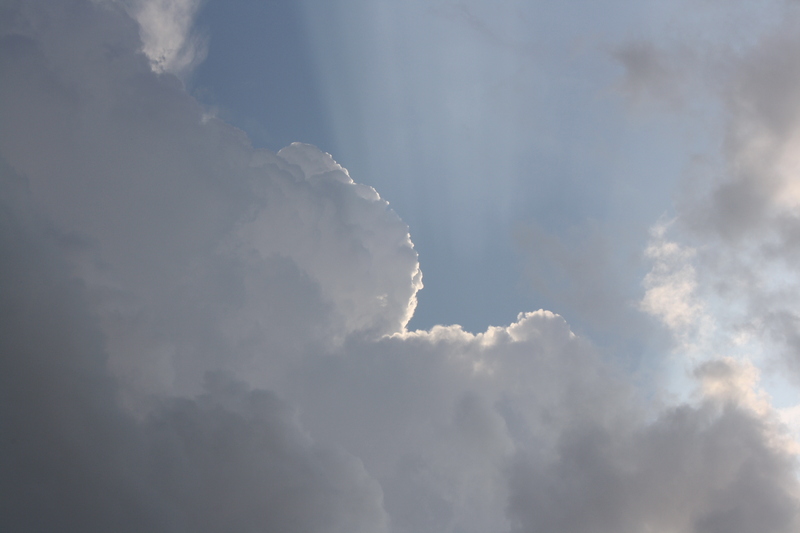 A low pressure became vertical over eastern New Brunswick early Sunday morning. 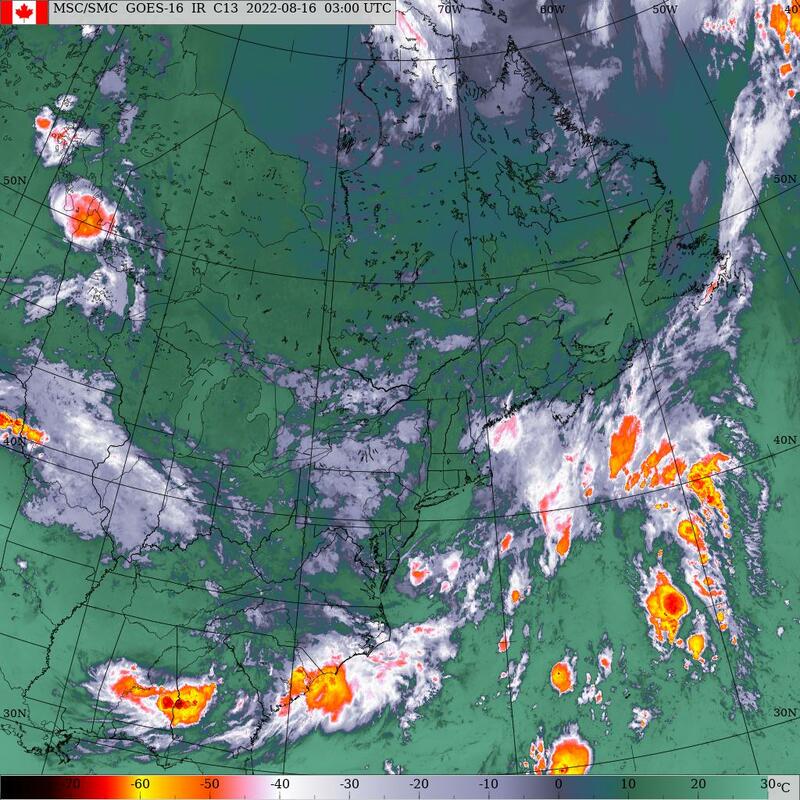 Circulation around the low saw numerous thunderstorms develop across all 3 Maritimes provinces with severe thunderstorm watches and warnings issued from Environment Canada for the effected areas. Watches and warnings were first posted for southeastern New Brunswick and the Annapolis Valley region of Nova Scotia by late morning. 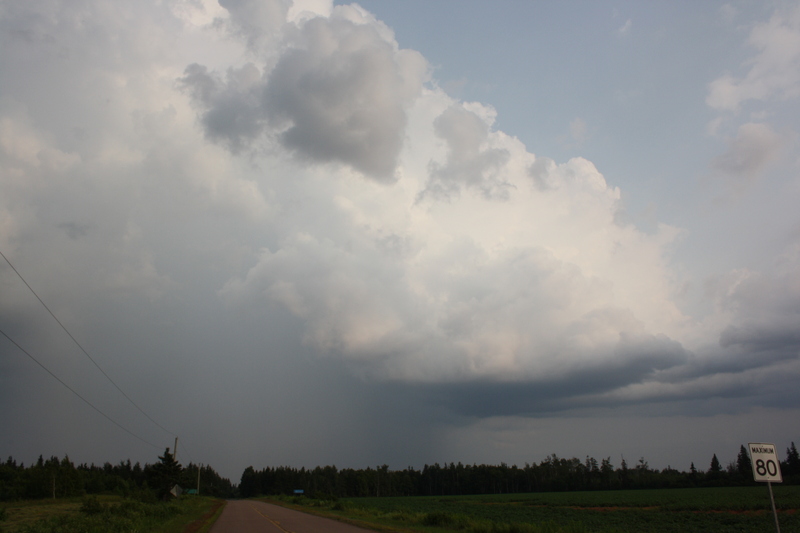 Thunderstorms developed across central PEI by early afternoon and severe watches and warning were extended to cover PEI. 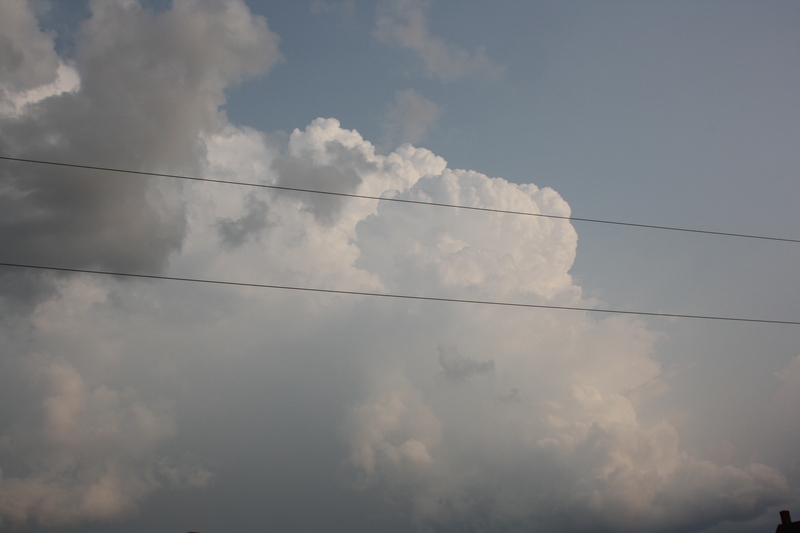 Here is a pic of the line of storms from a distance that I originally headed for. 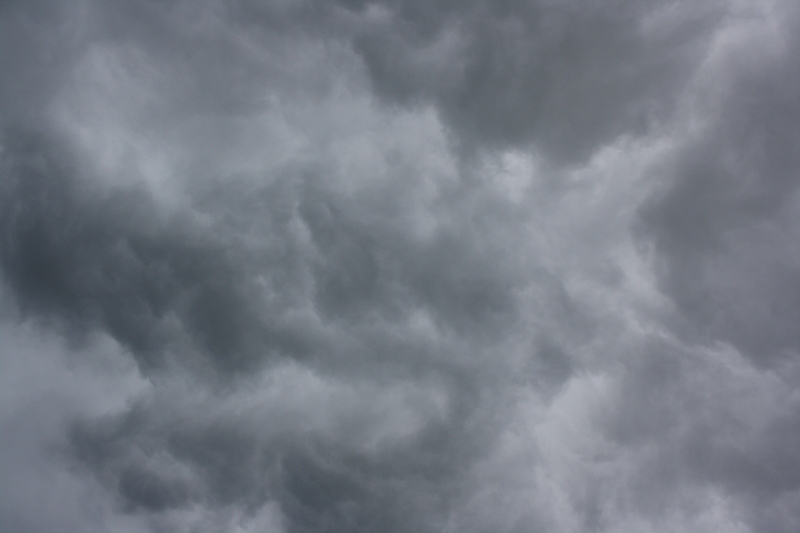 Here is a couple of pictures as the storm was overhead.